Celebrating the signing of the Letter of Intent for Tyler Williams are: (front, l-r) sister Kelsey Williamson, fiancee Brandy McClure, Tyler Williams, SSCC Men’s Basketball Head Coach Blake Kibler; (back, l-r) sister Madison Goble, mother Debbie Morgan-Goble, father Joel Botts, soon-to-be mother-in-law Tammy McClure, and soon-to-be father-in-law Pete McClure. Braxton Clark (left) signs a letter of intent to play basketball for Southern State Community College. 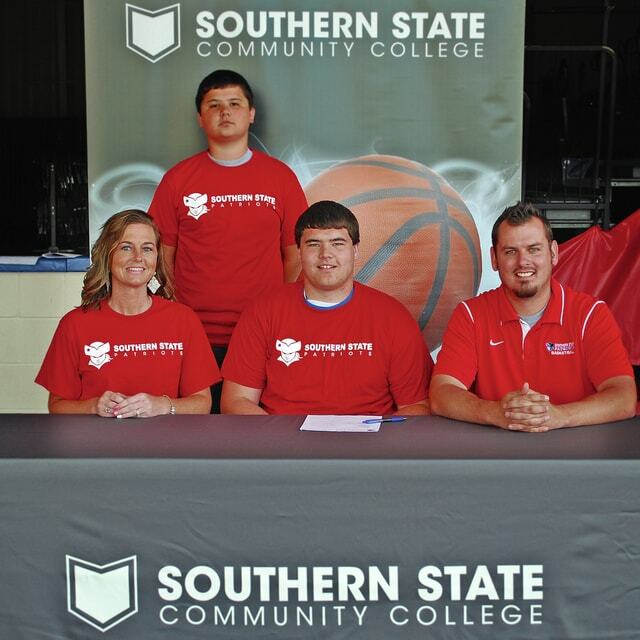 He is pictured with SSCC Men’s Basketball Head Coach Blake Kibler. Celebrating the signing of the Letter of Intent for James Sellars are: (seated l-r) mother Mary Mossman, James Sellars, SSCC Men’s Basketball Head Coach Blake Kibler; and (standing) brother Kyler Sellars.